These great plants are among the hardiest and easiest to grow plants you can find for your garden. They are solid friends in the coldest locations, and bring color and interest without asking for anything in return. The most important varieties are low-growing shrubs, with pink or white flowers in flat clusters, and often with colorful foliage as well. These look great for months and months, never tiring and yet asking nothing. Other forms have white flowers sparkling all the way along arching stems, and growing into medium-sized shrubs. Each group contains a variety of plants, and all are very useful in the garden, especially since they are very winter hardy, and bring color to even the coldest garden. These splendid and easy to care for shrubs are often used as foundation plants in gardens. They help you to create a stable structure of plants of different sizes in your garden. So valuable is that structure, that the flowers can almost be seen as an extra but very welcome bonus. Whatever way you use them, it is hard to imagine gardening without these stalwart shrubs. Used as foliage plants, the colored-leaves varieties create structure and color in one easy step, and form the framework of your garden. They are especially effective in spring, when their colors are at the brightest, and again in fall, when they join in the colorful celebration to mark the end of another season. These shrubs are invaluable, and should form part of the basic planting and layout of any garden. They are especially valuable if you are looking for easy-care plants that do not need special attention, particular soil conditions or winter protection. They are all hardy to at least minus 30 degrees, so they grow well in zone 4, and often in zone 3 as well. If you are gardening in a colder area, then to be successful the core of your garden should include a number of these bushes, perhaps in several varieties. They will grow easily and with little care, leaving you free to lavish more attention on your other plants. The best way to reduce the work in a garden is to fill large parts of it with easy-care plants like these. The lower-growing shrubs in this group flower in the summer, usually in shades of pink or red, depending on the variety. Many have brightly colored foliage, and they are the perfect way to add color to your garden from spring to fall. Plant them singly in small gardens, or in groups of three or five as part of the foundation planting around your home. These reliable plants will reward you with brightness and charm. 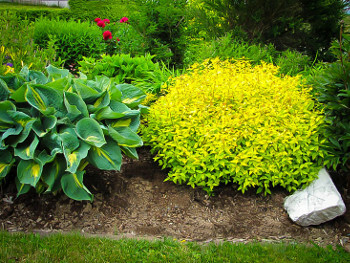 Plant a bed of these cheerful bushes, with different varieties grouped together, forming fluid clusters and lines. You can make attractive patterns by blending the colors and adding other types of small shrubs for variety. The larger kinds make wonderful background shrubs, since they flower early and afterwards, when they are just green and leafy, our attention simply moves to later-flowering plants in front. Often when we have beds turning corners, large areas at the corner need filling with a taller plant. A beautiful shrub with arching branches is ideal for that purpose. Another common use for all types of Spirea is as hedges. Hedges of all sizes belong in every garden, and help divide the space for different functions, and delineate various areas. 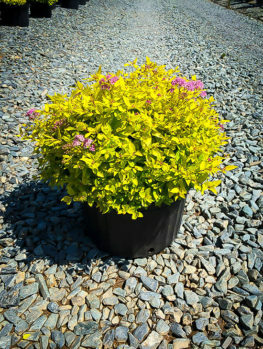 Many of the dwarf varieties of Spirea are ideal to edge a path or driveway, and only need a trim in spring to look neat and colorful all season. Because these dwarf varieties flower later in the year, they can be clipped hard in spring to keep them neat, and they will still be covered in blooms by the time summer is in full swing. The larger types make perfect informal barriers and boundaries to your property. Plant them along the line between your garden and your neighbors, or to separate you from the road. These hedges look wonderful in flower, and they stay attractive and green for the rest of the growing season. Because these plants are hardy to zones 3 or 4, it is in colder gardens that they have the greatest value. Gardening in cold areas can be difficult, with many plants simply unable to survive the winter, or at least not without significant die-back. For shrubs are as tough as they come, that almost seem to relish those freezing temperatures, these plants cannot be beaten. They certainly never complain by dying, and every branch will spring right back to life as soon as warmer weather returns. If you are just beginning gardening, then you cannot find better plants to get you started. You will love their color and hardiness, and you will love how they shine in any part of your garden. This is a large group of deciduous shrubs, which grow naturally all around the northern Hemisphere, in Europe, North America, China and Japan. Many grow in colder northern areas, in open countryside, mixed with small trees and other flowering plants. They are often found on the lower slopes of mountains, growing among rocks and surviving strong winds and snowy winters. This is why they are so hardy, and such a tough, easy plant to grow. They have been collected by gardeners for a very long time, who soon learned how easy they were to grow, and just how attractive they are. They also produce lots of variations, which provided the raw material for both classic and modern garden varieties. They all have small flowers, typically about ¼ inch across, either white or pink to red, depending on the species. Although the flowers are small, they make up for this by clustering together, with many flowers arranged in rounded or flattened heads. These either develop in spring or early summer all along the stems of the previous year’s growth, or they develop later in summer at the ends of the current year’s growth. 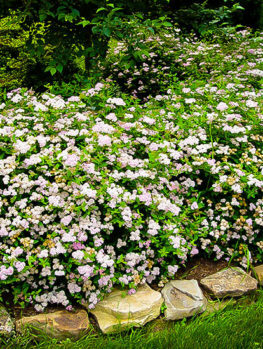 This distinction creates two groups of Spirea. One group consists of larger shrubs with sprays of white flowers in spring, usually on long, arching branches. The other groups are smaller plants, flowering in summer, and usually with pink or red flowers. The larger white-flowering plants have a long history in gardens, and were already popular well over a hundred years ago. Because they bloom in spring, the traditional time for weddings, the flowers were often used in bridal bouquets, and these plants are widely called ‘Bridal Wreath’ in memory of that use. The later blooming kinds bloom in summer and early fall, and the clusters of blooms are at the ends of the branches. Many of these plants also have spectacular, colored foliage, often golden yellow, pink or red. Besides being very easy to grow, these plants also easily cross-pollinate each other, so that many different hybrids and varieties have been produced by keen gardeners. This started in the 19th century, chiefly in Belgium, Switzerland and Germany, and continues to this day, and new varieties have been developed in the past few decades, often in America. These dwarf forms are almost all derived from the Japanese spirea (Spiraea japonica), which as the name tells us, is a native of Japan and China. This plant was first brought to Europe in 1850, as part of the great opening up of the East to gardeners, and several different forms were introduced over the next few decades. Later varieties were developed in Europe and America. Besides their great hardiness, cold resistance and ability to grow in any garden, in sun or light shade, these plants are notable for their flowers, which are pink to crimson, depending on the variety, rather than the white of the Bridal Wreath type. This added color makes these plants really stand out in the garden, sparkling in the summer sunlight and bringing beauty to the high season of your garden. Many have also been found with variations in leaf color, adding a whole extra dimension to the ‘spirea experience’. The original Japanese spirea has some reddish color in the new spring shoots, and this has been developed into flame reds and gold in some of the best varieties. These make a dynamic addition to your garden, contrasting with the green of other shrubs, and brightening the garden for months and months. ‘Little Princess’ – The perfect size for a smaller garden, or for mass planting in larger areas, this variety is a winner. It only grows perhaps 2 feet tall, but spreads up to 4 feet across, making a broad, low mound. In summer the bright pink flowers, in dense clusters at the ends of the branches, are charming for weeks on end, and in fall the leaves turn flaming red – ending the year with a bang. 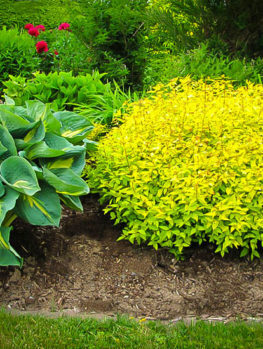 ‘Goldmound’ – This outstanding foliage variety also has bright pink flowers in late summer, but the real story is the gorgeous golden foliage that pops from the stems in spring and last all summer. Growing a little over 3 feet tall if untrimmed, it forms a blazing beacon in the garden, or mass planted it looks like a golden river flowing through your garden beds. ‘Froebelii’ – This old variety, created in Switzerland in the 19th century, is taller, reaching as much as 4 feet tall. It has dark crimson blooms, bringing an elegant look to the summer garden. ‘Goldflame’ – This is a classic American variety, developed in the 1970s. it can reach 4 feet in untrimmed, and the spring growth is a combination of red and gold – a striking plant indeed. Vanhoutte – This classic Bridal-Wreath type has arching branches covered in white flowers that can reach to the ground. It usually grows 5 to 8 feet tall with a spread to 7 to 10 feet. It is a hybrid between Spiraea trilobata x Spiraea cantoniensis. Developed in the 19th century by a Belgian nurseryman called L. B. Van Houtte. It full name is Spiraea x vanhouttei. ‘Snowmound’ – If you want a smaller plant of this type, then Snowmound’ is ideal. It never grows above 5 feet tall, and as much across, looking perfect anchoring the corner of a bed in a smaller garden. It is completely covered in white bloom in spring. First Snow – More correctly called Spiraea x cinerea ‘Grefsheim’, this is a compact form resembling a very neat Vanhoutte variety. It holds its leaves right to the ground, making it ideal as an informal hedging plant. It blooms very early in spring, and brings color before most other plants are awake. Choose sunny locations for the dwarf varieties – especially those with colored foliage, which will benefit from the direct sun to bring out their best. Such tough plants will, however, still thrive in partial shade, so for areas that receive sun only for a few hours each day, they are a perfect choice. The Bridal-wreath types will do well in full sun or partial shade, making them ideal for those out-of-the-way spots that don’t get a lot of sun. Almost any soil will be acceptable, except for areas that are constantly wet, or extremely dry and arid. 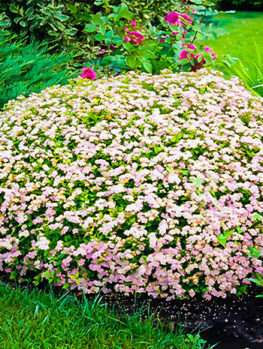 Once they are established, Spirea shrubs need no particular attention, and they are not bothered by pests or diseases. Water the pot thoroughly the night before planting. Some organic material is always beneficial, but not essential for such tough plants. You could use garden compost, rotted animal manure, rotted leaves, or peat moss. Mix this into the soil where you are planting, using a spade or fork to turn over the ground 8 – 12 inches deep. To plant, dig a hole to the same depth as the pot, but wider. During the first growing season, water once a week, or more if the weather is very hot and dry. Once established, these tough plants are resistant to summer drought conditions, and they needs no special care. They have no pests or diseases and are very hardy, even in the coldest parts of the country. Because these bloom later in the year, the flowers are carried on new growth. Spring is the time to give them a trim, as soon as the very first signs of activity are seen. For easy care, just trim over the plants with shears – this will keep them compact and neat. More careful pruning is beneficial. Remove any weak, thin branches at ground level and a few of the oldest stems as well. The remaining stems should be shortened back by about 1/3, cutting to a bud or new shoot. You can remove quite a lot of growth – this fast-growing shrub will soon fill-in, and the flowering will be profuse, with larger flower heads than are seen on unpruned plants. These plants flower on older shoots, and to keep that classic arching look, don’t trim back any of the long shoots. Instead prune shortly after flowering. Remove all the stems that have flowered, cutting back to new shoots you will see coming lower down the plant. Remove a few of the oldest shoots at ground level, and any thin, twiggy stems. The plant should look very open after pruning, but it will quickly shoot out graceful long stems to create that perfect look the following spring. If you are growing these plants as a hedge, then some flowering will be lost, although varieties like First Snow are naturally more compact, and respond well when grown as a hedge.